Plus, this is a quick and easy diner. 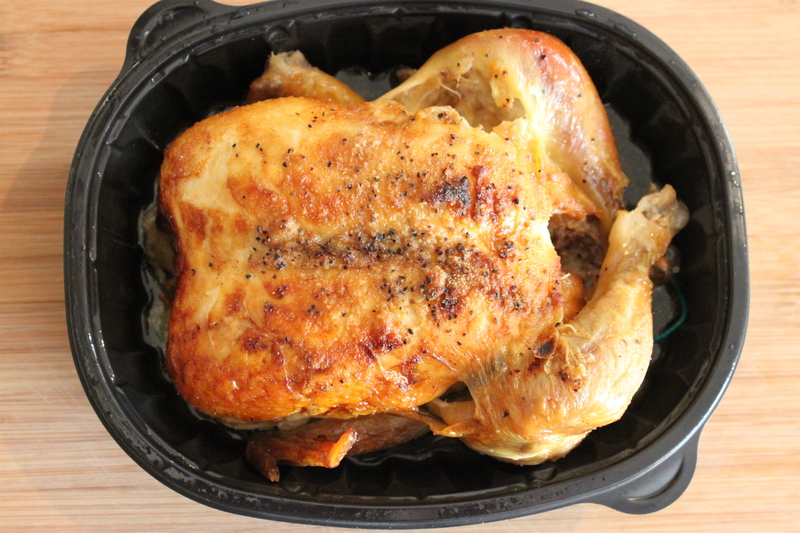 Start with a whole roasted chicken from the grocery store. It’s already seasoned, cooked and probably warm……and that speeds this process right along. After removing the skin (sure it’s delicious, but no one wants a big fork full of skin in their food) shred about a breast and a half by just pulling the meat apart with a fork. The Mexican grocery store in our neighborhood has hand-made, fresh tortillas all day long. I went with white corn. 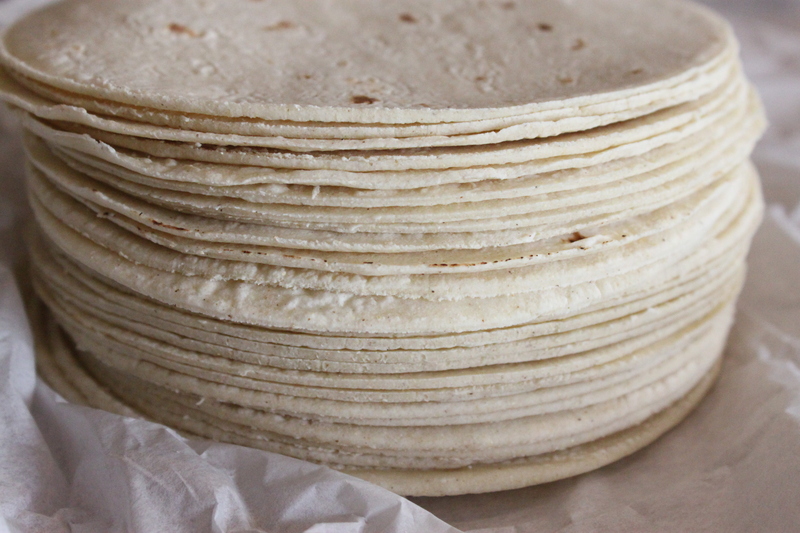 30 tortillas for a buck fifty….AND they are still warm. 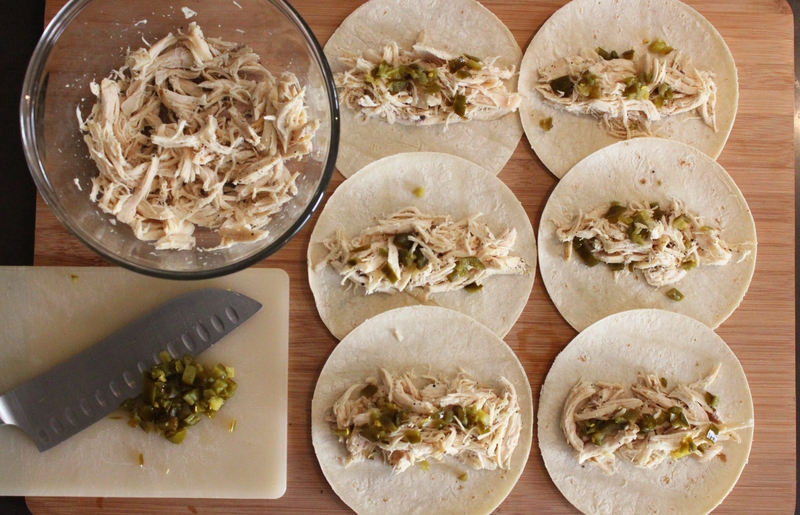 Lay out a few tortillas and add a handful of the shredded chicken and diced jalapenos to each. Don’t be afraid of jalapenos. 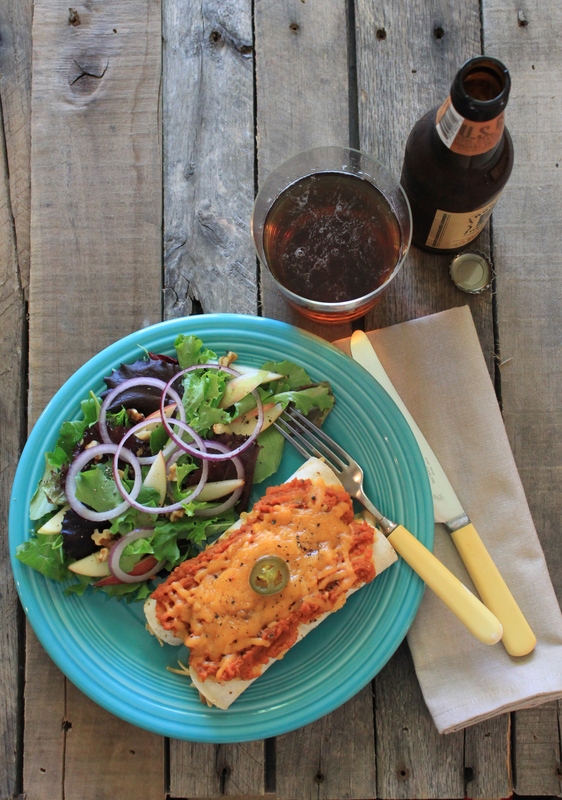 The pumpkin is mellow, and the jalapenos will be just a nice sharp complement to every bite. 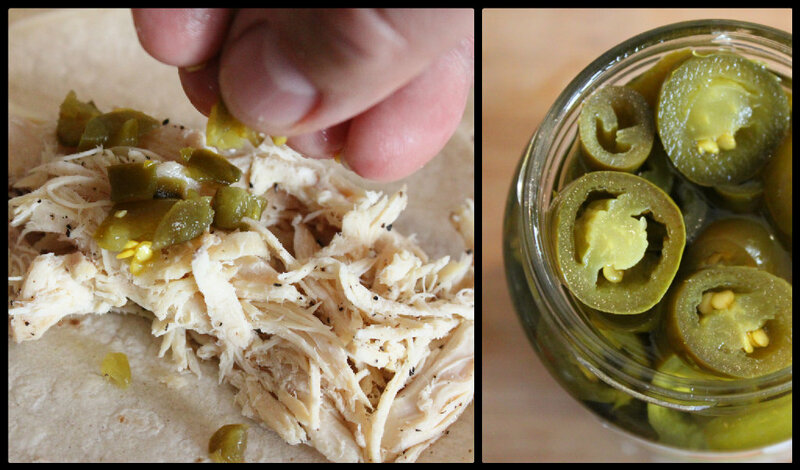 Fresh are great, but I prefer pickled jalapenos for this recipe. We call them “Nacho Slices” here in Texas. They should be crisp, and not soft. 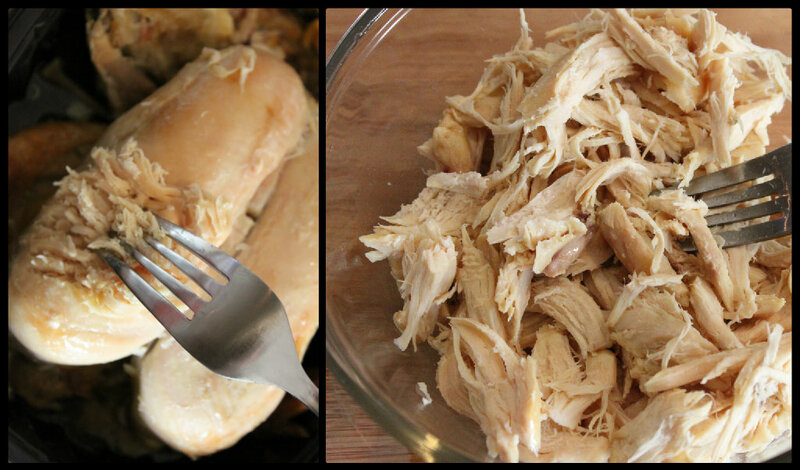 Dice them finely, on a plastic board, and sprinkle a few on top of the shredded chicken. 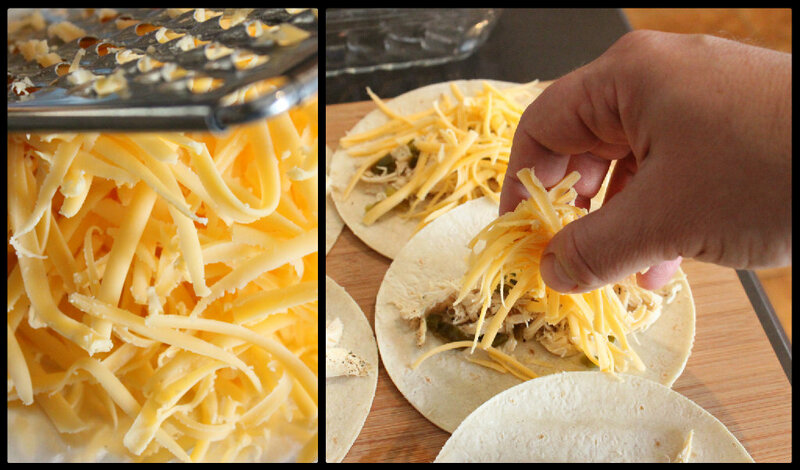 Then add a big fat pinch of freshly grated medium cheddar cheese. 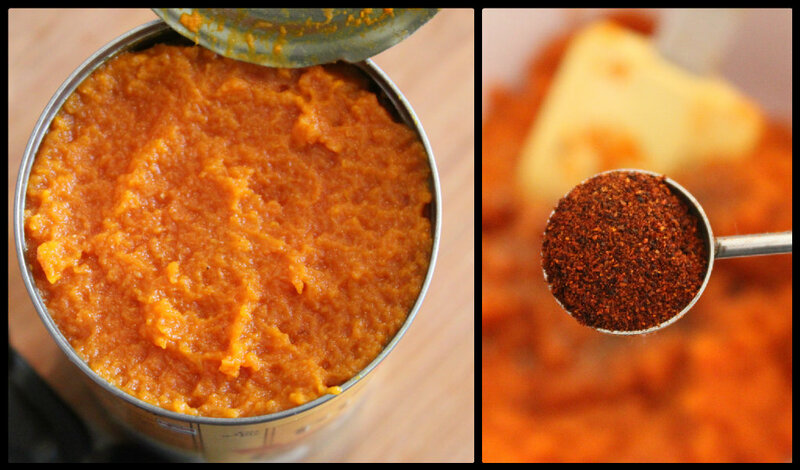 It is an absolutely perfect accompaniment for pumpkin and jalapenos. 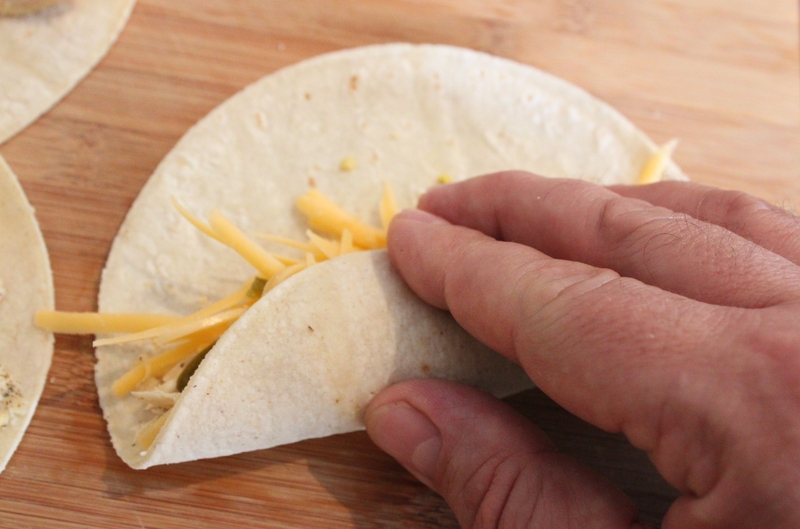 Roll your filling up in the tortilla nice and tight. 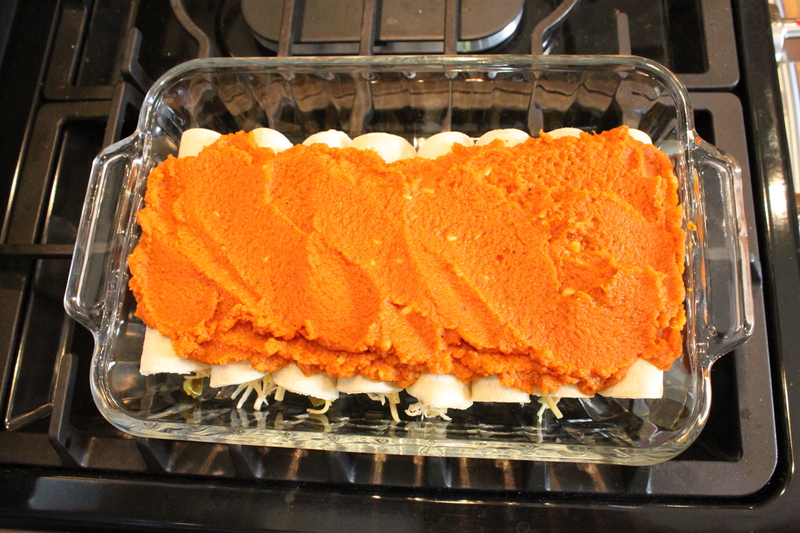 And line all the filled tortillas, fold side down, in a Pyrex baking dish. 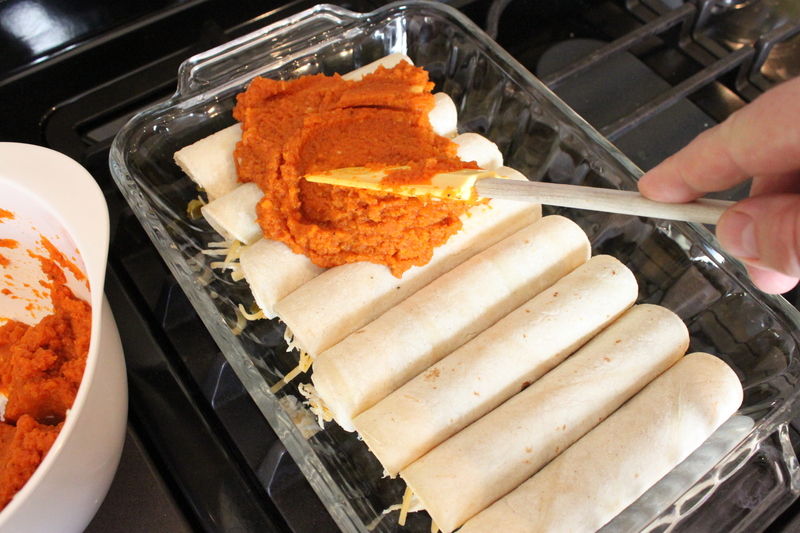 Spread the pumpkin mixture across the top of the rolled tortillas with a spatula. 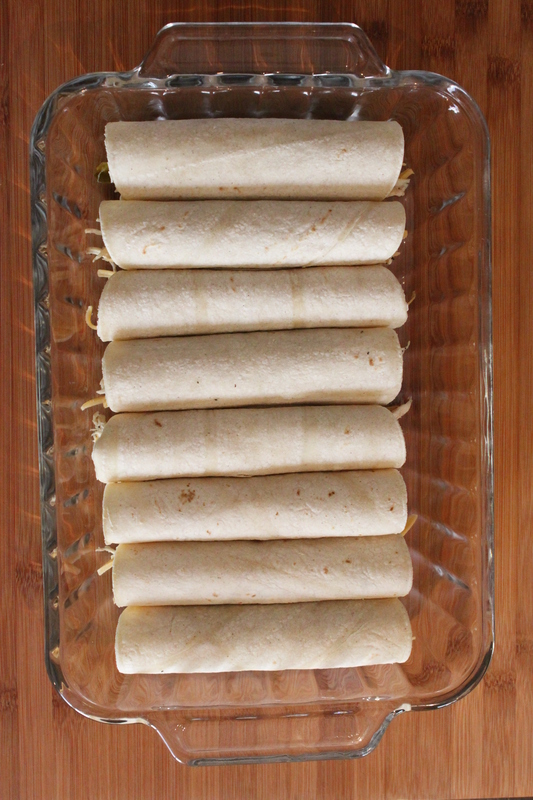 I just cover the top 90% of the tortilla rolls. 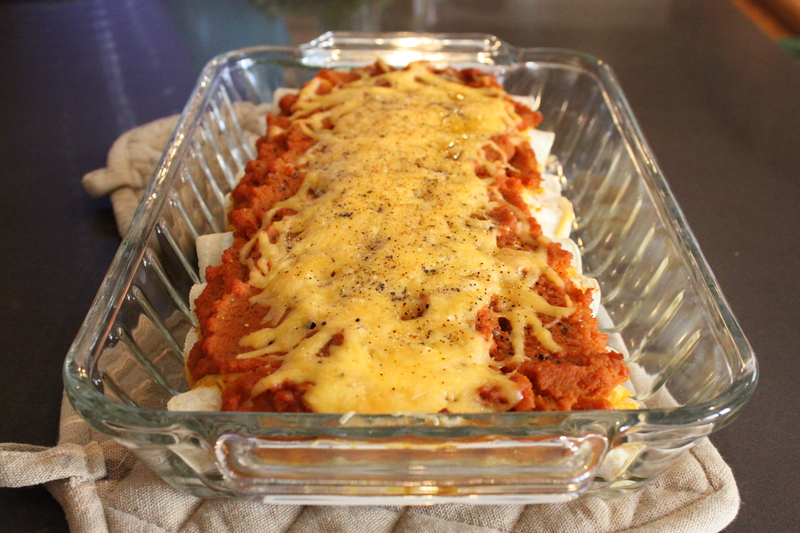 Then a huge layer of grated medium cheddar cheese. 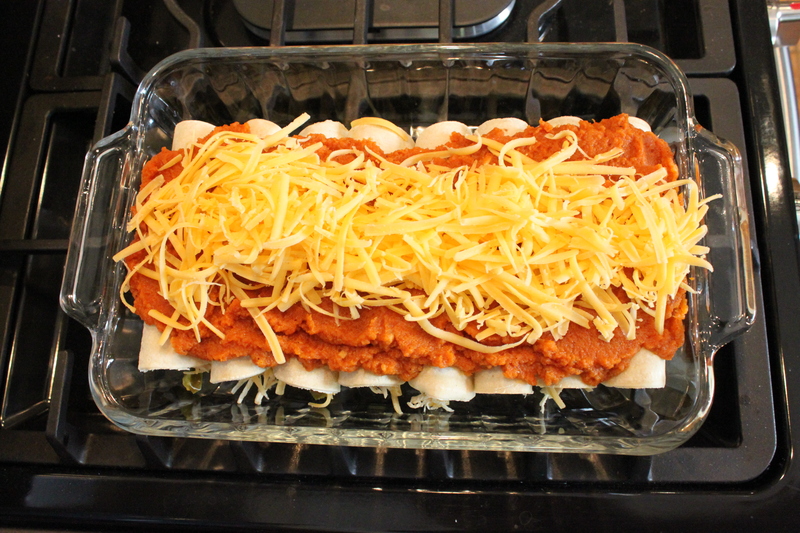 Until the cheese is melted and the enchiladas are hot through out. Enjoy with a side salad and nice dark autumn beer. 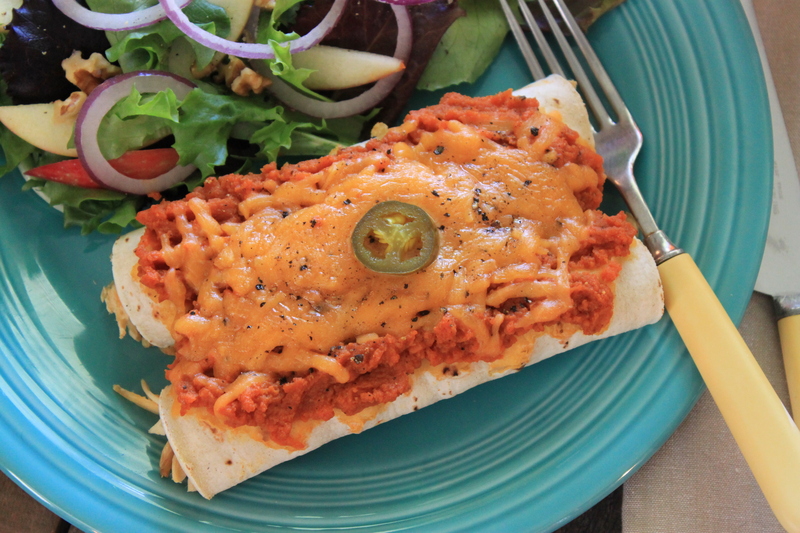 I am from the capital of Tex-Mex-El Paso, Texas and love enchiladas. I definitely will have to try this with pumpkin. This will be a welcome from a red sauce. Perfect for the upcoming pre Thanksgiving holiday brunch. Thanks James. They would be perfect for a brunch….enjoy! These look awesome! I am hungry now. Did you save me any? I can be there in about 27 hours if I drive quickly. These sound delicious, a combination I would never have thought of. And so envious of you being able to get fresh tortillas! I live in New Jersey — that’s not happening here. Yeah, I’ll bet Jersey is a little lacking in fresh tortillas. I just walk across the street. I will be waiting for that recipe! This reminds me of one of the contestants named Ben Starr on season 2 of “Master Chef.” He loves cooking with pumpkin and has his own website and cookbook which I bought. Great recipes and an even greater sense of humor, and from Texas I believe. He should have a recipe book with just pumpkin dishes out one day, hopefully soon. 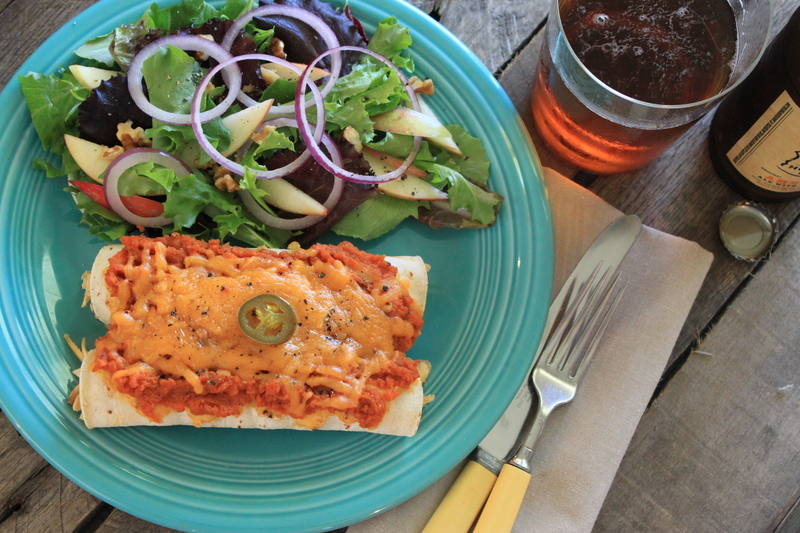 Anyway, looking forward to your pumpkin lasagna! I’ll look him up right now! I hope that beer is a Shiner. Great job, James, thanks. Wow! I would have never imagined using pumpkin like this, but I’ll bet it tastes great, particularly with the dark beer!